You’re planning a wedding in Italy; you’ve chosen your bridal gown, your color scheme, flowers and shoes. Now you have to make up your mind about how which kind of bridal hairstyle you are going to wear. This may depend on the kind of headpiece you’ve decided upon – if you want to keep it simple and wear flowers in your hair you might want to have your stylist sweep your hair into a loose chignon with some wisps hanging around your face to give you a soft and romantic look for your 2013 or 2014 wedding in Tuscany. The style pictured here is flattering to just about every face shape and can be created even if your hair is merely shoulder length. However, if you’re planning on wearing an intricate headpiece or an elaborate tiered veil you might want to go for a more ‘severe’ style, such as a plain French twist or a bun so as to not detract from the beauty of your headpiece or veil. Just don’t choose a style that requires dozens of hairpins to keep it in place or you might end up looking less than elegant! Of course, not every bride is going to have hair long enough for this kind of hairstyle – pixie cuts and short hairstyles are very popular nowadays – and again you will have to try to match the way you wear your hair with what you have sitting on top of it! A short hairdo can look stunning with a tiara and short veil. However, if you like to add some length to your hair, our hairstylists will find the best natural-looking extensions for you. Some brides don’t necessarily want to have a different wedding hair design for their wedding day – they prefer to keep their hair the way they always wear it – and the way their groom likes it! If you have a regular hair stylist at home be sure to have a practice run to find the style you want to have on your big day – and don’t forget to bring your headpiece to the salon so that it and your hairstyle will go together beautifully. We at Alfresco Wedding will find the perfect hairdresser for you, someone that can help you in finding the best solution for your hairstyle. 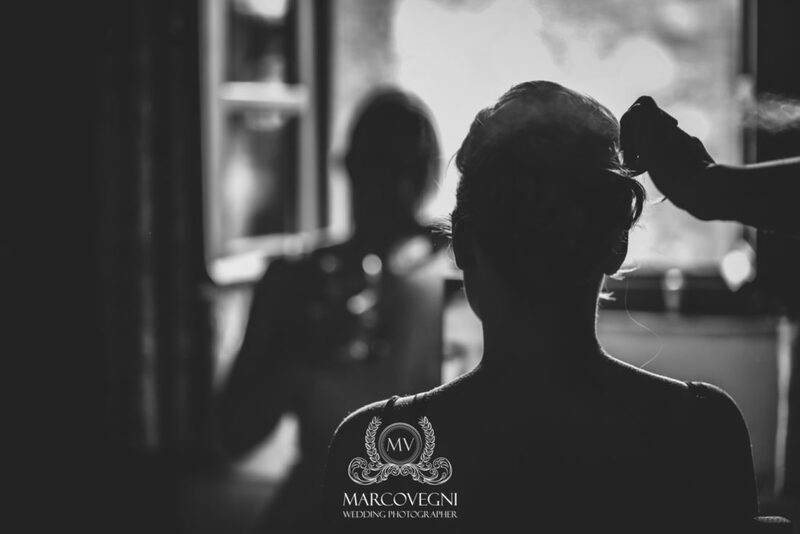 Our suppliers are the best professionals in Tuscany, both for hair design and for makeup application, and they collaborate with several famous Italian stylists. We help you to valorize your beauty, to highlight positives and hide flaws if there are, without shaking your style. Finally, we will make sure you to choose a bridal hairstyle that you will be comfortable with and not have to fuss with on your big day – you don’t want to be shedding hairpins all over Tuscany!